Juncus scirpoides.J.H. Miller and K.V. Miller.Forest Plants of the Southeast and Their Wildlife Uses.University of Georgia Press in cooperation with the Southern Weed Science Society. (Accessed 6/2014). 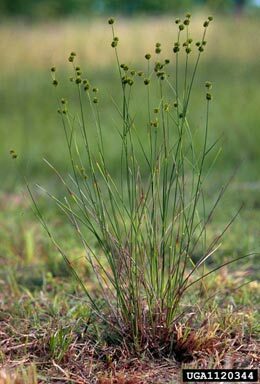 Juncus scirpoides is a perennial rush, stems slender, 30-80 cm tall, arising along a stout rhizome. Leaves usually two, sheaths broad, open, lobed at top, blade round in cross section, 0.1-0.2 cm wide, with horizontal partitions, (run leaf between fingers to feel these). Flowers 0.3-0.4 cm long, petals ridged, narrow, bristle-tipped, sharp, green, becoming brown with age; inflorescence of 4-15 round, densely flowered heads, 0.8-12 cm wide. Fruit capsule slightly longer than petals, oblong-triangular, sharp-tipped, June-Oct.
Habitat: Wet sandy soil, shores, meadows, open habitats.